11 states. 5 laboratories. 38 beagles. 1 month. Announcing Beagle Freedom Project (BFP)'s historic multi-lab, multi-state, and largest US beagle rescue to date! 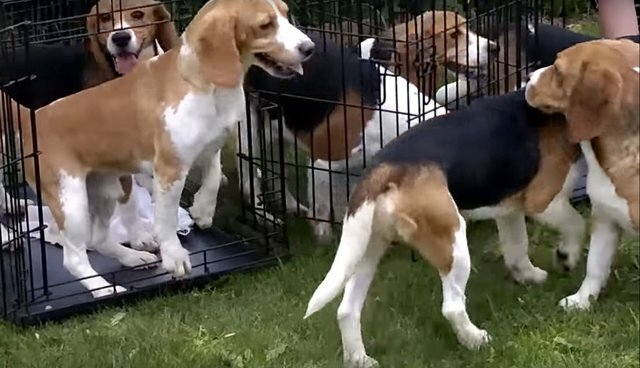 38 beagles freed in the largest coordinated release. Literally from coast to coast and several states in between scores of new families were created in an unprecedented rescue operation. Despite "animal industry" opposition and obstacles, BFP quietly secured the release and freedom of dozens of "purpose-bred for research" beagles after the labs deemed them "experimentally spent." BFP prevailed upon the lab workers to let us help them instead of just euthanizing the dogs, as is the standard operating procedure. Beagles of all ages and emotional temperament were greeted with a new chance at life, new opportunities to trust and heal, and unconditional love and patience from the best families we could find. Each dog in each of the rescues approached these new freedoms and the whole big world in front of them with a cautious, but excited, bewilderment. Many of the beagles bound out of their cages with exuberance, so excited to finally run, play, sniff, pee, and be the silly little dogs they are meant to be. A few of the others however have a tougher road ahead of them, still clearly suffering the effects of PTSD. These sweet scared little beagles flinch at the sight of a human hand and cuddle together for security in corners. With time, patience, and unconditional love thought, they will recover. With 38 new survivors to celebrate and 38 more stories to tell - our real work begins now. Translating the harrowing tale of these former victims into new inspirational ambassadors to provoke much needed public conversations about animal testing and what we can all do to end it is our collective job. The first step is supporting this release. The transportation, the veterinary costs (dozens of spay/neuter operations), the behavioral work, the GPS collars, the resources spent vetting and preparing the families ... this work is not cheap and nor should it be when lives hang in the balance. Please help - this was our most expensive operation to date! Thank you for being on the Beagle Freedom Project team. We could not do this work without you. Beagle Freedom Project needs your support so that we not only have a Summer of Freedom, but a whole year! Everyone can help, no matter the amount. Please just be generous and give from the heart, because heart and help is what these dogs (and BFP) needs!